Several years ago the rest of the world caught on to something that the American South has known for a long time: Life is better with comfort food and craft liquor. Since it seems like this slice of the world has no intention of easing up its grip on the cultural zeitgeist, we thought we would pop-down and discover first hand what trends Dixie is serving up now. Over the course of our road trip, we will be sharing dispatches from across the south as we taste-test current food and drink finds (and check out the country music scene along the way). Stay tuned! 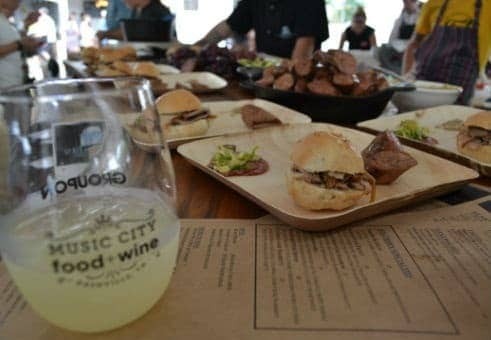 We arrived in Nashville and promptly jumped into one of our prime motivations for being in Tennessee: the Music City Food and Wine Festival. Our first event, Day One of the Grand Taste, found us strolling around Public Square Park trying out bites and sips from more than 50 local culinary celebrities, spirits purveyors, wineries, and breweries. It was a lot to conquer, but we came with our characteristically large appetites. Our favorite of the bites was a simple ramen noodle from chef Sarah Gavigan. Why did a ramen noodle win us over? It was cold, just what the body needs on a hot day. Flavor came courtesy of a slightly sweet, spiced-up red sauce. Our favorite dessert of the event was from The Catbird Seat, a local restaurant. Made to look like mushrooms in dirt, the dish comprised sticky, white-cream-filled donuts, served in a bag of moderately sweet chocolate morsels. Every time you shook the bag, the donuts picked up those chocolate bits. The dessert was both clever and delicious! We’ll be back at Grand Taste tomorrow to see what’s up with a whole new round of chefs. First, though, we’ve got some time to explore Nashville, and the Harvest Night tonight in Walk of Fame Park. Today, we managed to make room for an entirely fresh batch of Grand Taste bites from a mostly new selection of chefs. After a late night jumping between the festival’s Harvest Night activities and gigs associated with the Americana Music Festival, it took us a little time—and some big cups of java—to find our mojo. We lucked out and had our “Best Bite” the moment we walked in. Dale Levitski, the Top Chef personality who oversees the kitchen at Nashville’s Sinema, personally handed us cardamom-and-sugar encrusted French toast with a spicy mulled wine, poached pear, and farmhouse cheese. Other highlights from the culinary Nirvana included smoked short ribs that left our fingers gloved in sauce, and Brussels sprouts-hash served atop buttery mashed potatoes. But really, the highpoint of our night was actually something we drank: a Pomegranate Limeade with blackberry shine, grenadine and lime juice. More sour than sweet and remarkably refreshing, it was an ideal accompaniment for lots of the tastes as we wandered from table to table. Time to find a nice tree to kick back under with a cup of sweet tea. We have to rest up before visiting a couple of Nashville’s hot spots this evening. More on that tomorrow. After a night of drinks and eats at Pinewood Social and City House, where we sipped tropical cocktails by a pool (yes, really) and enjoyed the locally famous Sunday Supper, we headed east down I-40 toward Knoxville. Full after a breakfast of maple syrup-drenched pancakes, crispy chicken fried steak, and buttery, flaky biscuits, we knew we needed to move a bit for fear that our pants would stop fitting before the end of our trip. So when we got to Knoxville, we broke out the running shoes and jogged right for the center of town. Restaurants, bars, and adorable shops intrigued us. We were excited to explore this gateway to the Smoky Mountains. And it was a good thing we went on a long run. After a meander through the streets near Market Square, we made our way to Stock and Barrel for dinner. To kick things off, we ordered the Tennessee vs. Kentucky bourbon flight and some fried pickles and fried green tomatoes on which to nosh. The tomatoes were made special by the addition of goat cheese and a balsamic glaze. We went crazy over what came next: duck fat French fries. These were hand-cut fries, served with grated parmesan, sea salt, and smoked garlic aioli for our dipping pleasure. After all of this yumminess, we still had room for Stock and Barrel’s best-in-town burgers and signature desserts: smooth-as-silk peanut butter pie and a boozy s’more milkshake with toasted marshmallows and bourbon cream. We capped the day back at The Oliver Hotel for some shuteye in preparation for our next adventure. The accommodations represent Knoxville’s premiere boutique hotel—a place that has been lovingly restored and thoughtfully designed. The hotel is relatively small in size, but it is big on personalized service. It’s exactly the kind of spot at which we like to stay. Viewfinder Tip: Planning a foodie road trip? Ask servers to pack up leftovers so you can eat them in the car. Midway through our road trip, after days upon days of eating and drinking, we needed to spend some quality time outside of the restaurants and bars that are framing our visit to the South. Knoxville, the gateway to Great Smoky Mountains National Park, provided the excuse we were looking for. We made the trip from Knoxville to America’s most visited National Park in just about an hour, reluctantly bypassing Dollywood on the way. As fanatics of the U.S. National Park System, we’ve got a firm handle on what makes many of them special. And Great Smoky Mountains isn’t about wowing visitors with spectacular sights. Instead, this park gradually lulls you in with its rolling mountains and seemingly blue haze that envelops the area. Our hike to Alum Cave Bluffs had us traveling up, up, up a trail that paralleled a babbling creek in a dense, verdant forest. It was pure bliss. If we didn’t have a dinner reservation back in Knoxville, we likely would have stayed to witness sunset. But nothing was going to keep us from eating our way through the menu at Knox Mason and chatting with founders Matt Gallaher and David Rudder. Our meal started with bourbon-paprika pork rinds and deviled eggs. The pork rinds had a barbeque-like quality that totally converted a previously reluctant pork rind eater into a fan of fried swine. We sampled those snacks with a trio of drinks—the best of which was a refreshing watermelon margarita with salt foam. Never before had we seen this smart way to bring salt to a margarita. Restaurateurs, take note! Later in the meal, the kilt greens salad really got our attention. Incorporating bacon fat for part of the vinaigrette, the salad (comprised of garden fresh frisee and kale atop juice-sopping toast) was impossible to resist. Our mains, a succulent chicken breast with a colorful butternut squash puree, and a thick garlic-spiked pork chop, were equally satisfying. While we downed our dessert—banana pudding with vanilla wafers and marshmallow cream—we reflected on some of the tidbits Matt and David had shared with us earlier in the evening. They mentioned that their goal was to create a place where hyper-local and popularly priced food takes center stage. They certainly achieved that goal. Knox Mason is a success by all measures, and it’s safe to say we’ll be hearing a lot more about their modest restaurant for years to come. We were eager to get to New Orleans, the final stop on our road trip, because our first order of business was some craft cocktail taste-testing. Talk about excellent motivation to minimize highway rest breaks. Shortly after arriving in town, we checked into our hotel and walked over to Doris Metropolitan, right in the heart of the famous French Quarter, to kick off our first evening. Konrad Kantor, bar manager and our own personal cocktail whisperer, suggested the Sazerac, and we happily complied. What better place than New Orleans to make a Sazerac the first sip? After all, the drink is known as “America’s First Cocktail,” and it was created in New Orleans. Konrad concocted two versions of this iconic drink so we could determine which we preferred. The first was a straightforward take, with bourbon, bitters, and lemon. The second was more complex, comprising Cognac, a second type of bitters, and other goodies. We preferred the traditional approach. We didn’t have too much time to linger over our decision because we had to zip through the revelers on Bourbon Street to make our dinner reservation at Domenica Restaurant, a new hotspot from John Besh. If you’ve heard anything about this eatery, you likely have heard about the restaurant’s Israeli cuisine and its signature whole roasted cauliflower with whipped goat cheese. The dish isn’t something we normally would consider ordering, but its reputation compelled us to give it a go. Good thing we did; it was the highlight of our meal. Butter, white wine, and olive oil form the foundation of the dish’s incredible flavor, while sugar, bay leaf, lemon juice, and roasted red pepper flakes give it some depth. The cheese concoction—intended for dipping—is what sets the dish apart. Goat cheese, feta, cream cheese, heavy cream, olive oil, and salt come together to make a creamy, rich accompaniment for the vegetable. Whatever you order at Domenica, be certain to save room for dessert. The generous slice of cannoli cake, with its candied almonds and pistachio pieces, had our taste buds singing. We were tempted to go back for another serving after spending the later part of the evening listening to traditional New Orleans jazz at the historic Preservation Hall. Thankfully for our waistlines, we resisted. On Sunday, we found our home-away-from-home hangout: District Donuts Sliders Brew in the trendy Garden District. This restaurant serves up craft doughnut, gourmet sliders and micro-roasted coffee. Our favorite culinary finds tend to be elevated comfort foods, so we felt right at home. Our maple-bacon doughnut was dreamy, but it was the mimosa doughnut—with champagne cream filling, topped with candied orange—that impressed us most. We also had our first cold-brew coffee (coffee prepared with no hot water) with nitro. It tasted like stout without the alcohol; an experience neither of us will forget. When we’re not out eating, drinking, and exploring here in New Orleans, we’re settled in at the Hyatt Regency. The hotel is located between the tourist-centric French Quarter and the hip, upscale Garden District. That means we get to gawk at the massive Superdome from our room’s window. Pretty cool. In wandering around the adjacent neighborhoods, we’ve noticed many new-to-the-city restaurants. Tourism in New Orleans reached an all-time high in 2013, restaurateurs are jumping at the chance to get in on the latest and greatest hotspots in the local culinary scene. Kingfish, where we dined Sunday night, was inaugurated just last year; Chef Greg Sonnier has been part of the New Orleans dining scene for more than 20 years. At Kingfish, a starter stole the show. The beet salad, with yellow beets, pea shoot greens, cheese, roasted pistachios, and sherry vinaigrette, was earthy yet bright. We also sampled the restaurant’s featured Gulf fish, which was served on a brick of pink Himalayan salt. The dish was exquisite in its lemony, buttery goodness. Fortunately, we left room for a dessert of cheesecake made with Cajun spices and topped with blueberry compote. On Monday morning, after a much-needed long run, we walked over to the up-and-coming Bywater District. With its unmistakable Bohemian and carefree feel, it reminded us of communities back home in Seattle and Portland. We had brunch at Booty’s, which locals love for its menu of street foods from around the world. The hearty hornado—roasted pork served in a bowl with mashed potatoes, tomato, and onion—was one of our favorites because it made us nostalgic for one of our original adventures together in Ecuador. On the sweet side, we gobbled up the papanasi, which were warm, spiced donut holes served with apricot jam. Today, as our road trip draws to a close, we’re immensely impressed with what the South served up in the food and drink department. From Nashville to New Orleans, we got to try out both old favorites and bites and sips of the future. Come this way with an empty stomach and an adventurous spirit. You won’t leave disappointed. What’s your approach to a long road trip?